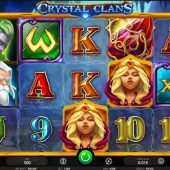 Crystal Clans slot is where iSoftBet takes us into the dark world of ancient mysteries and although the reels are spectacularly set facing out of a secret cave, it's the rather haunting and beautiful music which will likely grab you first. 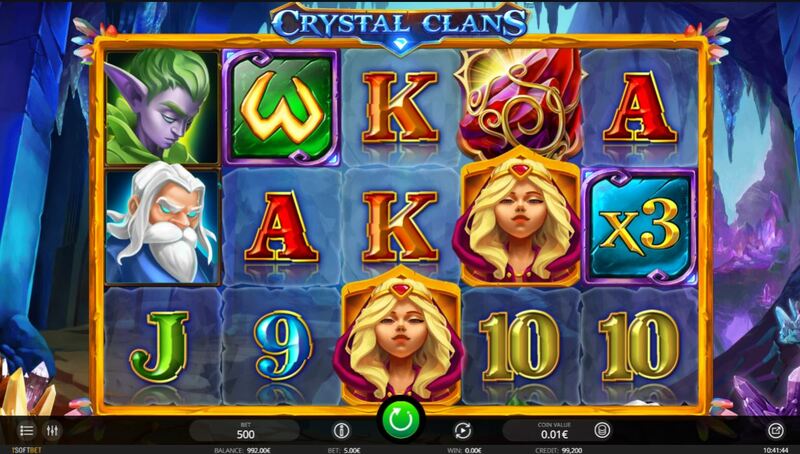 Crystals are nothing new in slots and in fact feature in many older games such as the rather juvenile Crystal Queen from Quickspin, but the most similar-looking ones are Merkur's Crystal Heart and WMS' Crystal Forest which both have the same air of mystery about them. So let's go and join this clan and see if any of those mystical crystals turn out to be diamonds! We get a higher amount of paying lines than usual on a standard 5x3 grid, in this case 50. Symbols are either single, double or triple-stacked and the pays are quite good for the 5-of-a-kind (5OAK) wins. The Prince pays 40x, the Princess 20x, Wizard 6x, Pixie 4x and the Imp 3x with the other 6 icons being the card values paying 2x for the higher 3 and 1x for the lower. You see Wilds on all reels and 5 of these equal the highest pay above but they have more to them than usual. You can get standard single Wilds on all reels as said, but reel 5 also features a Wild with either a 2, 3, 5 or 10x multiplier overlaid and if you get this it doesn't need to be part of the win to multiply it. The mysterious happenings in the Crystal Clan do not end with the Wilds - there are scatters on all reels and you only need 2 or more to trigger the free games. These must be consecutive reels from the left though but you can have some fun here because just the 2 scatters will award 10-15 spins, 3 scatters 16-25 spins, 4 scatters 26-35 and finally all 5 will treat you to 36-50 free games. Now if you trigger the spins with with the Wild multiplier on reel 5 then that will apply to all your free games. Not only that, but during the free games any 2 to 5 Crystals will multiply your remaining free spins total by 2, 3, 5 or 10x respectively. There is a cap of 100 free games, perhaps unsurprisingly and the multiplying Wild doesn't appear on reel 5.